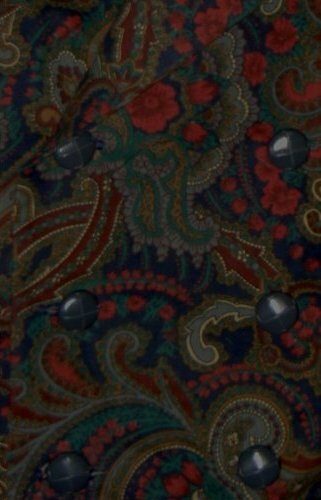 There was this wonderful paisley fabric sitting deep in a box of remnants that said it wanted to be a tailcoat. But the voice was muffled until it was opened one day. Then the voice was very clear and insistent. "Look what lovely colors and patterns I have, " it said. "Navy, gray, burgandy, green, beige. I would complement a fine man's wardrobe." 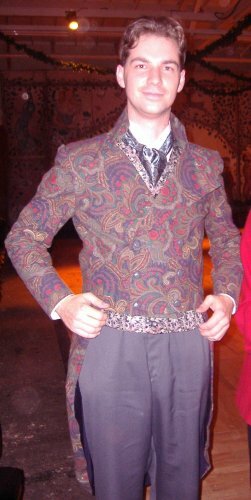 So, I pulled out a pattern and turned it into a men's double-breasted 6 button paisley tailcoat with navy satin lining and folded collar. The paisley fabric is an upholstery cotton type fabric. 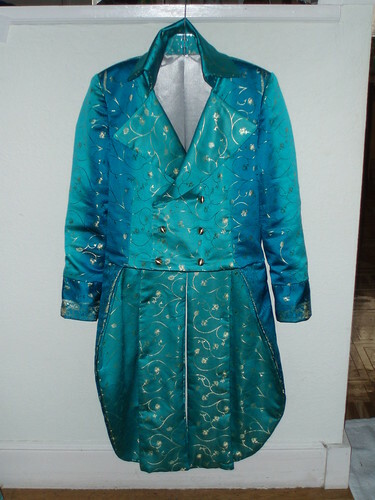 I also tried to add glove pockets to the tailcoat lining. Now, of course, the dang tailcoat wants to be worn. It's never been with a man and wants to go dancing and such. What a whiner. 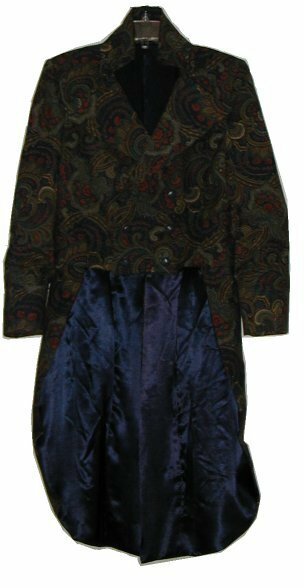 So, if any of you good men would kindly like to take a paisley tailcoat out on dates and such, please consider purchasing it. Small - pattern said chest 34-36"
No guarantees that the tailcoat will talk to you. PEERS Dickens Fair Reunion Ball was one of the most populated I've seen at the San Mateo location. Danced some lovely dances. Drank a wine spritzer. 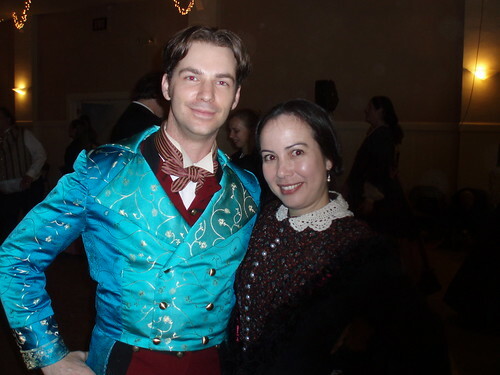 Talked costuming with some people. Was introduced and have already forgotten several names (drats). Okay made one tailcoat from that fabric and maybe will be able to see it on a body tonight at PEERS. Still not sure what I'm doing with the rest of the fabric, but after seeing how this turned out, I kind of want a tailcoat for myself.